Search.searchtpn.com is the PUP that uses misleading techniques to prevent removal. Use Reimage to locate malicious components and get rid of them faster than with uninstall instructions. A full system scan blocks virus reappearance and prevents traffic to malicious domains. Search.searchtpn.com by Polarity Technologies Ltd. is another shady search engine that is promoted in freeware packages as a useful tool. This New Tab Search offers tracking packages directly from the new browser’ startup page. So-called Search.searchtpn.com virus spreads as “Track Package Now” extension that is compatible with Google Chrome, Mozilla Firefox, Internet Explorer, and Safari web browsers. The problem is that it might be installed without asking direct user’s permission. collection of non-personally identifiable and browsing-related information. In order to strengthen its presence, this browser hijacker might also modify Windows Registry and install browser helper objects that prevent users from Search.searchtpn.com removal. However, it’s still possible to get rid of the PUP, and it’s recommended to do it as soon as possible. Due to the suspicious Search.searchtpn.com redirect tendencies, your computer and privacy might be at risk. When using this questionable search tool, you might be redirected to potentially dangerous or phishing websites where you can suffer from cyber criminals. 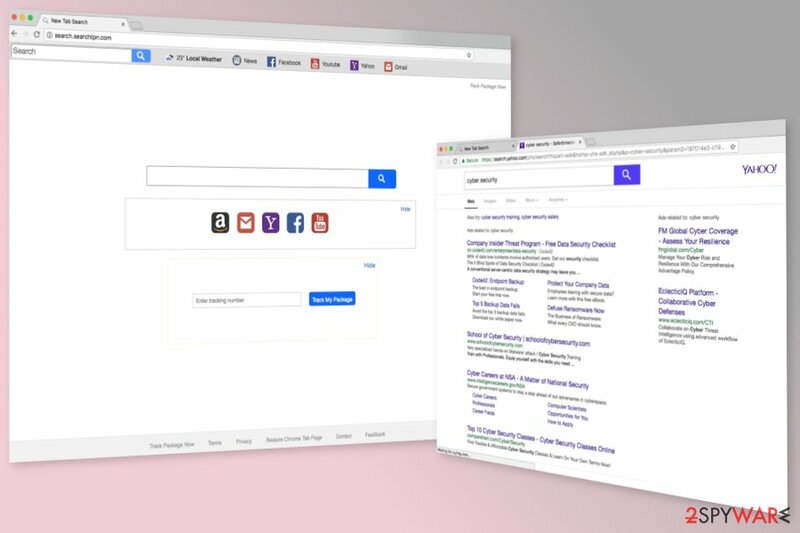 Thus, you should not be tricked by hijacker’s functionality to show you results from Yahoo search. In order to avoid possible threats caused by this cyber threat, you should remove Search.searchtpn.com using reputable anti-malware/anti-spyware program, such as Reimage. The hijacker probably was installed in software bundle that may have included more unwanted applications that should be eliminated as well. However, if you do not want to install any additional software, you can try to delete Search.searchtpn.com manually. Our specialists created illustrated and detailed guidelines which are provided at the end of the article. Search.searchtpn.com redirects search queries to Yahoo results page; however, security experts do not recommend trusting it. Browser hijackers, as well as other PUPs, usually spreads added in software bundles which can be any freeware or shareware you download from online sources. Therefore, the Search.searchtpn.com hijack might occur when you download such programs incorrectly and rely on Quick/Recommended settings. These settings do not notify about possible additional programs. In order to see them and reject their installation, you have to use Custom/Advanced settings only. Security specialists from Los Virus also tell that choosing reliable freeware download sources helps to minimize the risk of the hijack. You can remove Search.searchtpn.com manually by following the guide given below. However, this process requires putting some effort. You have to find all hijacker-related entries in the operating system and web browsers. It’s important to get rid of them all in order not to find this questionable search engine after rebooting PC. However, if you do not feel capable of performing manual Search.searchtpn.com removal successfully, you should opt for the automatic elimination. It is completed using an updated anti-malware program and resetting affected browsers. To delete Search.searchtpn.com virus from the PC, you have to make sure that any hijacker-related entries are not left in the system. Here, look for Search.searchtpn.com or any other recently installed suspicious programs. Wait until you see Applications folder and look for Search.searchtpn.com or any other suspicious programs on it. Now right click on every of such entries and select Move to Trash. When in the new window, check Delete personal settings and select Reset again to complete Search.searchtpn.com removal. Once these steps are finished, Search.searchtpn.com should be removed from your Microsoft Edge browser. Here, select Search.searchtpn.com and other questionable plugins. Click Remove to delete these entries. Now you will see Reset Firefox to its default state message with Reset Firefox button. 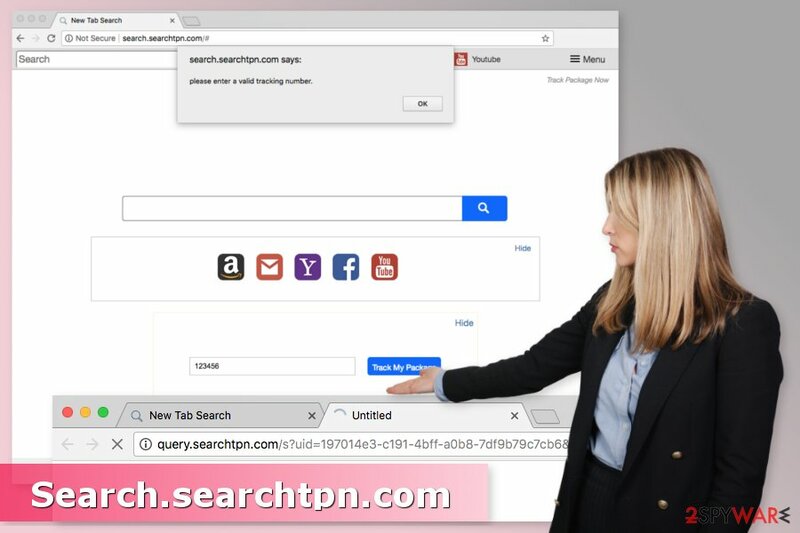 Click this button for several times and complete Search.searchtpn.com removal. Here, select Search.searchtpn.com and other malicious plugins and select trash icon to delete these entries. Click Reset to confirm this action and complete Search.searchtpn.com removal. After the browser hijack, you should get rid of all extensions or plugins that might be related to this potentially unwanted program. Here, select Extensions and look for Search.searchtpn.com or other suspicious entries. Click on the Uninstall button to get rid each of them. Here, look at the Homepage field. If it was altered by Search.searchtpn.com, remove unwanted link and enter the one that you want to use for your searches. Remember to include the "http://" before typing in the address of the page. Now you will see a detailed dialog window filled with reset options. All of those options are usually checked, but you can specify which of them you want to reset. Click the Reset button to complete Search.searchtpn.com removal process. ^ Chris Hoffman. PUPs Explained: What is a “Potentially Unwanted Program”?. How-To Geek. Tips, tricks and tutorials. ^ John Callon. Analyst Report: Phishing Attacks Are a Business Problem, Not an IT Problem. 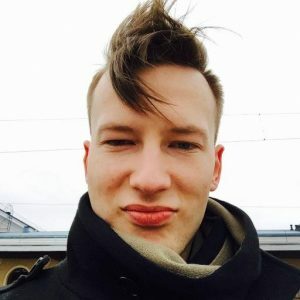 Cyren Security Blog. News, insights, and research surrounding internet, web, and email security topics. This entry was posted on 2018-01-24 at 04:36 and is filed under Stealing programs, Viruses. You can quickly scan the QR code with your mobile device and have Search.searchtpn.com manual removal instructions right in your pocket. How did you remove Search.searchtpn.com?